My sons and I have each made hiking sticks from limbs that I trimmed in the yard. My kids used aspen and mine was made from a maple branch. Each stick used a different paracord wrap and somehow my kids were able to choose different ones without arguing about which design was better. Amazing. My youngest son got a turk’s head handle in Broncos colors. See my post on Paracord Planet for the details of our long turk’s head. My oldest son used a two color wrap followed by a gaucho knot on the top. The details of this wrap will be in a future post here. There are quite a few tutorials that walk you through how to make a hiking stick. The basic idea is to find a fairly straight stick that you can hold with your elbow at a 90 degree angle. Once you have the stick, remove the bark, sand smooth, and then finished with tung or linseed oil. Removing the bark is the most tedious portion of the process, but it’s also quite fun to see all of the bark flying off the stick. 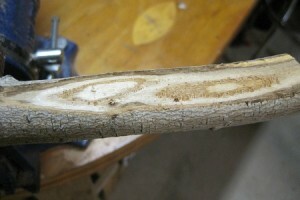 I used a 1″ wide chisel to remove the bark from our sticks. The key to removing the bark is getting through all layers. After the first layer comes off, it looks complete, but there is still another layer to go through. Each type of wood is different so use a sample piece for practice. After the bark has been removed, sand the stick smooth (which also allows you to cover up your de-barking mistakes) with a medium grit sandpaper and then a fine grit. After wiping the stick of all dust, finish it with at least three coats of tung oil to bring out the natural wood color and to give a nice protective layer to the wood. With the tung oil finish dry, you can move on to wrapping the handle with paracord. Take some time to research wrapping techniques to find one that suits your style and also the stick. For my youngest son’s stick, the turk’s head paired nicely with the grooves and marks that were on the stick. That sounds like some type of wine pairing advice, but it’s worth doing some research. The video below shows the spiral hitch used for my handle. 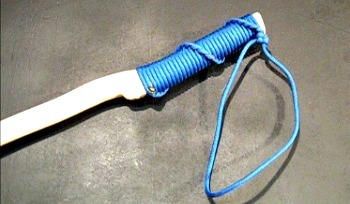 It is a fairly easy technique, but it results in a comfortable handle. Depending on the size of your hand, you can expect to use from between 13-17 feet of paracord. My wrap used a little over 14 feet. That is why you were making a hiking stick, right? The combination of the cross knot at the top and the melted paracord end on the clove hitch at the bottom should keep the wrap tight. If it does start to loosen, some contact cement or other glue could be used to fix the paracord in place. Hopefully this walk through has given you some ideas for your own hiking stick. It’s a fun project to try with your kids especially if they start by finding their own stick and choose their paracord colors. AWesome post! This is so informative! I learned much from this. Thanks!